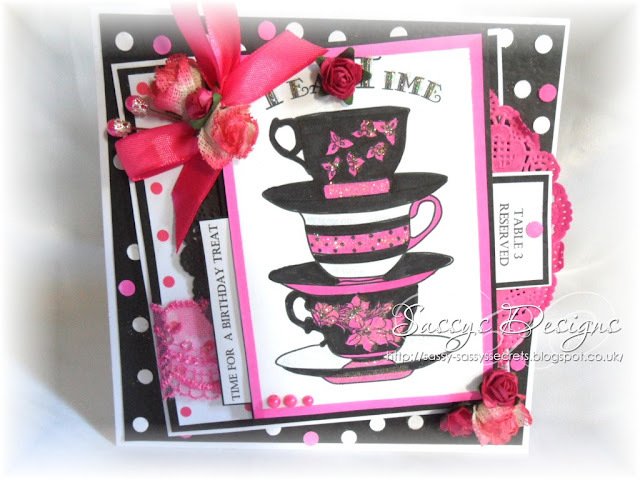 Wonderful card Sassy, I like the striking colours that bright pink lace and doily. Hi Sassy, yes the weather is officially the pits! 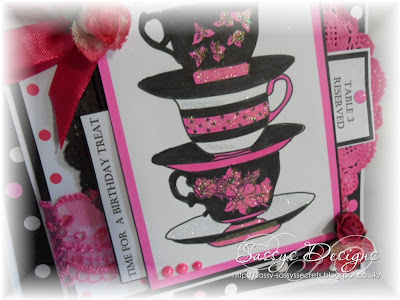 Great card lovely, I love the pink and black combo! wonderful image. What can I say, I just love love love this card! Fantastic Colors! Fantastic layout! Just Fantastic all over! Floppy Latte of Floppy Latte's Digital Designs! WOW!! this is stunning Sassy. Such a wonderful colour scheme and a gorgeous image. The paper looks amazing so well worth all your hard work of sticking on those dots!! What a gorgeous card! I so love the color combo =) Really cute! Stunning card Sassy! Love the image and colour scheme. Fab card and such patience to stick down all the dots! You are amazing Sassy. Fab colour scheme too. hunni, this is so lovely, I really like this creation with these lush colours! Now I will scroll down to see what I have missed here! Huggles and millions of strokes to Marvina too! gorgeous card Sassy and love the rich pink and black together - so striking! Wow! this is gorgeous Sassy!! what a wonderful image and I love the pink and black theme. The papers and embellies are all gorgeous! !